Fördjupa dig i den pittoreska staden Peking under en hel dagsutflykt till stadens mest betydelsefulla historiska platser. Besök legendariska landmärken som den förbjudna staden; absorbera den heliga atmosfären vid himlens tempel; och förundras över Tianansmen-torgets strukturella skönhet. Ledsaget av en kunnig guide, gräva in i den rika historien i staden och upptäck en av de äldsta kulturerna på jorden. Bekväm rundturstransport från ditt hotell i Peking ingår på denna turné. Avgår från ditt centralt belägna hotell i Peking och klättra ombord på en bekväm, luftkonditionerad tränare. Kom fram till din första historiska höjdpunkt, Tiananmen-torget och få fascinerande inblick i den moderna kinesiska historien, eftersom din guide ger information om kulturrevolutionen av ordförande Mao. Utforska grunderna på en omfattande rundtur och se imponerande monument till The People's Heroes och ordförande Mao. Gaze på Tian'anmen Tower och förundras över den utarbetade utsmyckning av Folkets stora hall. Därefter vågar du till den legendariska Förbjudna staden för att utforska en kulturell ikon. I de fyra palatsliga salarna finns representationer av varje kinesisk dynasti i historien; dyka in i den rika historien för varje familj som din guide erbjuder en informativ och insiktsfull berättande av landmärket. Revitalize med en smakfull och uppfyllande lunch och sedan gå till himlens himmelska tempel för att se en 15-talsbyggnad som hylder Ming och Qing-dynastierna. Hör om hur templet var ett centrum för bön och offerceremonier, avsluta din autentiska kulturupplevelse med lite traditionellt kinesiskt te. Our guide was wonderful - went out of her way for us as Tiananmen Square was closed due to the African conferences and delegation visits planned for there. She spoke excellent english and took us on a side visit to a tea house which was also great. Her local knowledge and knowledge of the history surrounding all of the sites was flawless. Even though it was raining we were still in awe of the size of the Forbidden City and we definitely enjoyed seeing the Temple of Heaven. Our guide was pleasant and did stop several times to explain a few things but then also gave us a little time to explore on our own. You could easily see these places on your own but the guide did tell us bits of information as well as he made the ticket purchases and entrances much easier. 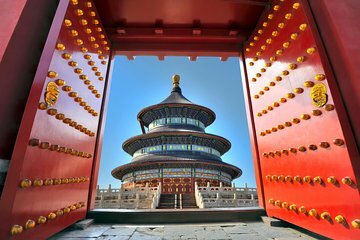 Tour Stops: 1 Tiananmen Square, 2 Forbidden City, 3 Silk Factory, 4 Temple of Heaven, 5 Foot Massage, and 6 Lunch at Shanshuijian Lamb Spine Hot Pot. Overall, the Silk Factory and Foot Massage were not part of the advertised tour and were obviously over-priced tourist traps. I would have preferred more time at the Forbidden City and Temple of Heaven rather than stopping at these places. Furthermore, lunch was very average. The tour cost was very low and all transportation was provided, however, I would recommend picking a more expensive tour that does not have all the side stops. Our tour guide spoke good English and she showed us around some very interesting places. Be aware though, the queue through security at the Forbidden City can be very long, and locals push their way closer to the entrance. Other than the general behaviour of the locals, this tour was fantastic, especially if you want to learn about the history of China. Guide was ok at English, however she was quick and knew how to avoid the crowds. So shes perfect. Lovely tour, the guide Mark was extremely friendly and joyful. He gave us plenty of details to the history and development of the different monuments. He spoke english relatively well although he had a hard time understanding some of our questions. The tour to the silk factory was not very interesting but these kind of detours are to be expected in a country like China. Overall definitely worth the money! La cité interdite est à voir et le guide permet de ne pas avoir le nez plongé dans son bouquin. Par contre 1h30 est rapide pour la Cité même si la visite du Temple du Ciel est très agréable mais peut se faire sans guide. Excellent Tour. Our tour guide Cherry did an excellent job. She put things in context. She also helped us to make great compositions for photography including panorama shots. 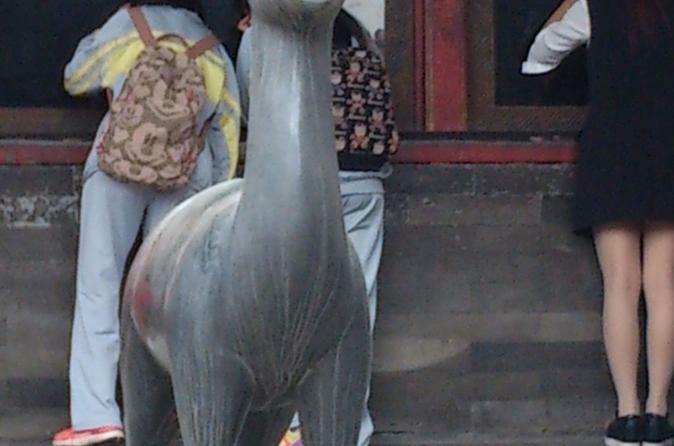 I have just completed the Beijing Historical Tour and was extremely disappointed. I would absolutely advise you not to book this tour. The tour guide gave us only about 10 minutes in Tianmen square and simply pointed out the various building - with no mention of the cultural revolution. Nor did we get the opportunity to walk around the square- this was by no means a comprehensive tour of the square. The tour of the forbidden city was also disappointing as we spend only 90 minutes there all tour books and guides suggest a minimum of 2-3 hours - for the central route alone!!! !, we were only taken on the central route, I would have thought that a tour where this was the main draw card would at least have taken a more comprehensive route and tour of the renown attraction. Then we were taken to the Silk factory, which was more like a shopping trip than an informative part of the tour - we were there for over 2 hours, much longer than we spent at the Forbidden City, this is completely unacceptable. After lunch we were taken to yet another shopping stop neither of these were mentioned in the description. The final place was the temple of heaven - we were given less than half an hour here and did not get the opportunity to explore the rest of the extensive grounds and gardens. Further it was promised that there would be a traditional tea that we would participate in- this was not mentioned by the guide and absolutely did not happen.